Hariri was in Saudi Arabia for two weeks, leading to speculation he wasn't allowed to leave. Lebanon's Prime Minister Saad al-Hariri said he'll soon return home. A trip to France ended his weekslong stay in Saudi Arabia that led to speculation he was being held against his will. Hariri denied that suggestion in a Twitter post. While in Paris, Hariri met with French President Emmanuel Macron and said he would be back in Beirut in a few days, in time for Lebanon's Independence Day celebrations. Earlier this month, Hariri traveled to the Saudi Arabian capital of Riyadh, where he gave a televised announcement he was stepping down as prime minister. He claimed he feared for his life and that Iran was interfering in other Arab states' affairs — with the help of Hezbollah. Currently, Hariri's party, the Future Movement, shares power with Hezbollah, a Shiite political party with a paramilitary wing. Several countries consider it a terrorist organization. Lebanon's president said he would wait for Hariri to return before moving ahead with finding a replacement. Lebanon's constitution requires a Sunni Muslim hold the office of prime minister. 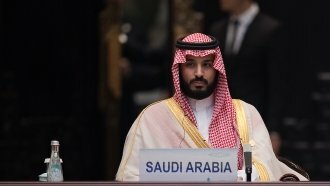 Saudi Arabia is a heavy backer of Hariri; his unorthodox stay in Saudi Arabia and out-of-character phrasing in his televised resignation led many to believe he was being coerced by Saudi leaders.